This engraving is an inset of a larger engraving published in ”The Illustrated London News”. 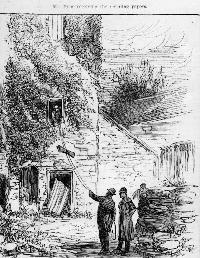 It depicts Mr. Jasper Douglas Pyne, M. P. for West Waterford receiving his morning newspapers at Lisfinny, Tallow, Co. Waterford. The newspaper’s caption is: ”THE STATE OF IRELAND”, implying that the whole country is in a state of disarray.The entire image is available on the website at index number: UK2406. During the ”Land Agitation” of the late 19th Century, Mr Pyne had encouraged William Shanahan and his supporters to resist the sheriff if any attempt was made to evict him. Subsequently he heard he was to be arrested for incitement so he barracaded himself with two of his men into his tower house at Lisfinny. He claimed he had enough provisions for three months. Two thousand people marched to his home to support him. The police did try to arrest him but found the tower too great an obstacle. After 3 months he escaped by creating an diversion but was arrested outside the House Of Commons, returned to Kilmacthomas for trial and sentenced to six weeks in jail. A few months later, he disappeared, and is presumed to have drowned, while crossing the Irish Sea on a packet steamer. 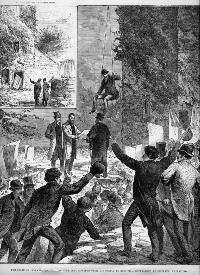 An image from the Illustrated London News, showing Mr. Jasper Douglas Pyne, M. P. for West Waterford, being lowered from the second storey of his house at Lisfinny, Tallow, to meet a delegation of supporters. A smaller image is inserted top left showing Mr. Pyne receiving his morning newspapers. This insert can be viewed on its own on the website at index number: UK2405. The newspaper’s caption is: ”THE STATE OF IRELAND”, implying that the whole country is in disarray. During the ”Land Agitation” of the late 19th Century, Mr Pyne had encouraged William Shanahan and his supporters to resist the sheriff if any attempt was made to evict him. Subsequently he heard he was to be arrested for incitement so he barracaded himself with two of his men into his tower house at Lisfinny. He claimed he had enough provisions for three months. Two thousand people marched to his home to support him. The police did try to arrest him but found the tower too great an obstacle. After 3 months he escaped by creating an diversion but was arrested outside the House Of Commons, returned to Kilmacthomas for trial and sentenced to six weeks in jail. A few months later, he disappeared, and is presumed to have drowned, while crossing the Irish Sea on a packet steamer. An engraving of Lisfinny Castle. The castle was built by the Fitzgeralds in c.16th century. Lisfinny House was built in the early 19th century. Jasper Douglas Pyne elected Home Rule M. P. for West Waterford in 1885 was the owner in the late 19th century.